Automatically upload language files to a GCS bucket of your choice at export. This integration is available starting from the Pro plan. Use this integration if you serve static content including your language files from a Google Cloud Storage bucket. 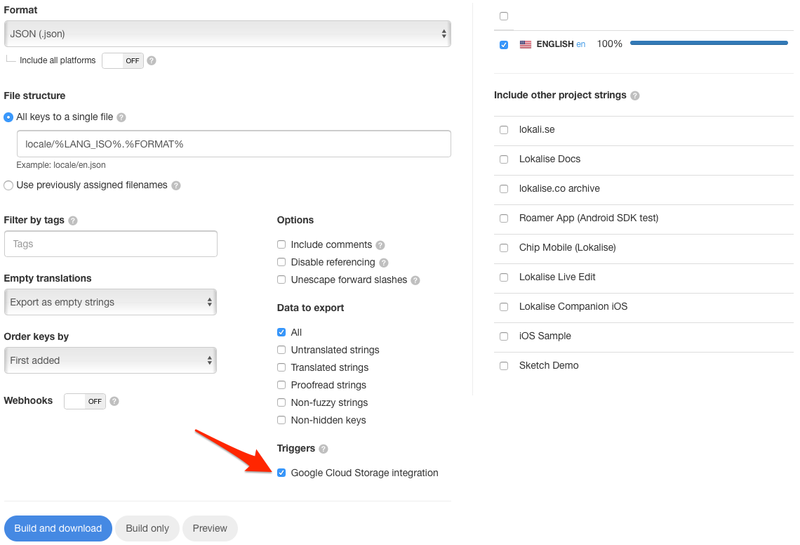 Navigate to project settings > Integrations > Google Storage and press Connect. You need to specify Service account key JSON, Project ID and Bucket name. We highly recommend to create and use a separate service account key JSON for this integration. Follow the instructions on how to create service account credentials. As the integration is set up, you can trigger it with each export. If you are downloading using web dashoard, tick Google Cloud Storage checkbox in the Triggers section. CLI tool version 0.47 or higher is required to use this integration. Use --triggers=gcs as a parameter. Use triggers=['gcs'] as a parameter. In case the upload fails (due to misconfigured integration) you would receive an e-mail from Lokalise. The e-mail body will contain GCS response with errors.